Ebola is back in Congo. This time it may be harder to fight. The affected area is teeming with refugees and armed militants who may target aid workers. The Ebola virus has popped up again in the Democratic Republic of Congo, days after another outbreak was declared over — but this time it may be harder to fight. The new outbreak is across the vast Central African nation from the last one, 1,500 miles away and in an area disrupted by conflict and teeming with refugees, aid workers say. It will be difficult and dangerous to track down cases to isolate and treat them. “Here we are responding to an outbreak of a high-threat pathogen … in the context of a war zone,” Peter Salama, deputy director-general of emergency preparedness for the World Health Organization, said at a news conference in Geneva Friday. Today our Deputy Director-General for Emergencies @PeteSalama briefed the media on the ongoing #Ebola response in the Democratic Republic of the Congo #DRC. Congolese officials say four cases of Ebola have been confirmed in the eastern part of the country, near the border with Uganda. 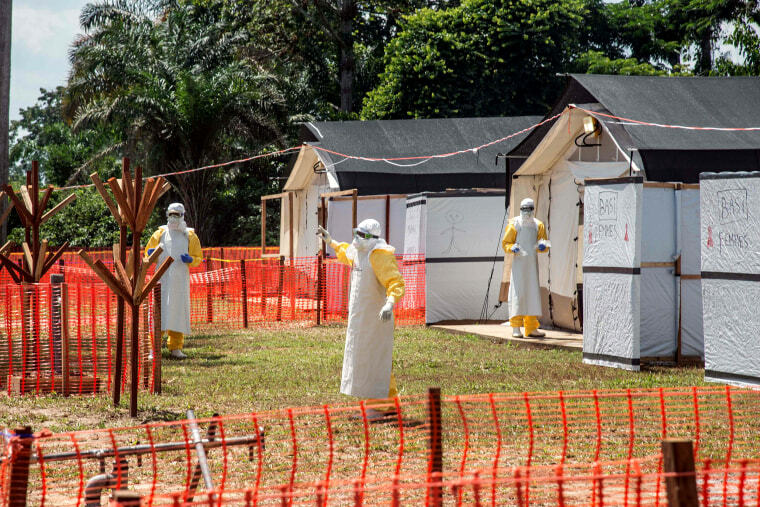 At least 20 people have died and workers are trying to determine whether they died of Ebola. “Already one health worker has died. We know at least two have been infected,” Salama said. “This is happening in the middle of a huge humanitarian crisis,” Jose Barahona, country director for Congo for the aid organization Oxfam, told NBC News. Aid workers will not only have to travel over a large, heavily forested area looking for cases, but also they’ll have to negotiate with militant groups that may control stretches of roads, small mines or entry into towns and villages. Barahona said aid groups such as his had already been struggling to get food, water and other assistance to people in the area. This is the 10th outbreak of Ebola in the Democratic Republic of Congo, but the first in a part of the country that is affected by conflict. Salama said it was relatively straightforward to get around to look for cases and distribute vaccines and treatments during the last outbreak, in the northwest part of the country. It won’t be so easy this time, he said. “Contact tracing is the absolute foundation of any response,” Salama said. If a patient is infected with Ebola, health workers must track down every other person who has been in physical contact with that patient, to isolate and monitor them for any signs of infection. “We don’t know to what extent we are going to have to rely on armed escorts for contact tracing,” Salama said. An experimental vaccine was used during the last outbreak, and the same risks would go with trying to get that vaccine out to people who need it. “We do have 3,000 doses of the Merck vaccine still available in Kinshasa,” the capital, Salama said. But he said WHO is holding off on distributing it until workers know that the Ebola strain causing the eastern outbreak is the same strain the vaccine targets, and until there’s a better idea of how difficult it will be to ship it to affected areas. Barahona said there are suspected Ebola cases in at least six distinct areas. “This is a larger area than we are used to dealing with,” he said. And large groups of people move, often unexpectedly, he said. “Every time there is a military attack, civilians run away,” Barahona said. Armed gangs often hold up aid convoys to rob them, he said. There is a risk that they may kidnap aid workers or seize supplies to hold for ransom. The first case appears to have been a 65-year-old woman who died last week, Salama said. The family held a burial that was considered unsafe. Ebola victims can spread the virus even after they are dead, and anyone who touches a body can become infected. "Seven deaths have occurred in her immediate family," Salama said. Ebola kills anywhere between 20 percent and 70 percent of the people it infects. There are several experimental treatments, but no certain cure. The virus spreads via bodily fluids such as blood, sweat and diarrhea.